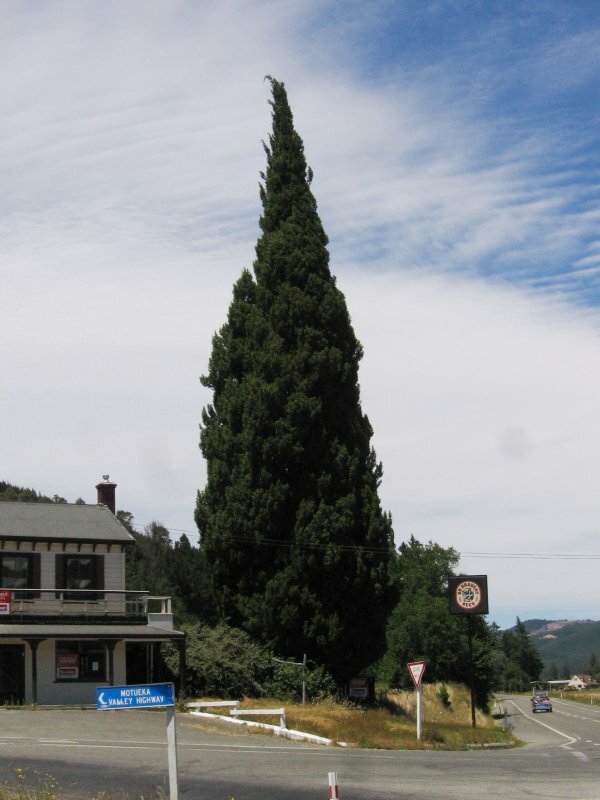 A fine fastigiate formed tree prominently located beside the Kohatu Pub which was built in 1894 by Harry Bromell. Tasman District Council Protected tree number 839. Notes: Many authors have recognised that the species broadly assumes two growth habits, fastigiate or horizontal, and have assigned subspecific taxonomic ranks on that basis. It is widely thought that only the horizontal form predates human activity, with the fastigiate form having a horticultural origin dating to early historic or prehistoric times. Thus it is a cultivar, not a variety or subspecies. There is also some question as to whether the fastigiate form is strictly heritable; it appears that "horizontal" specimens may arise from "fastigiate" stock (Stankov 1999, Farjon 2005). Quite visible from the road side.